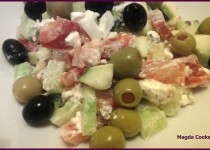 I think I wanted to post a recipe of greek salad since I started blogging. I consider it one of the easiest, tastiest salads you can make at home. I didn’t post it, because the base one, I would like to think that everyone knows how to do it and no need to write about it again. 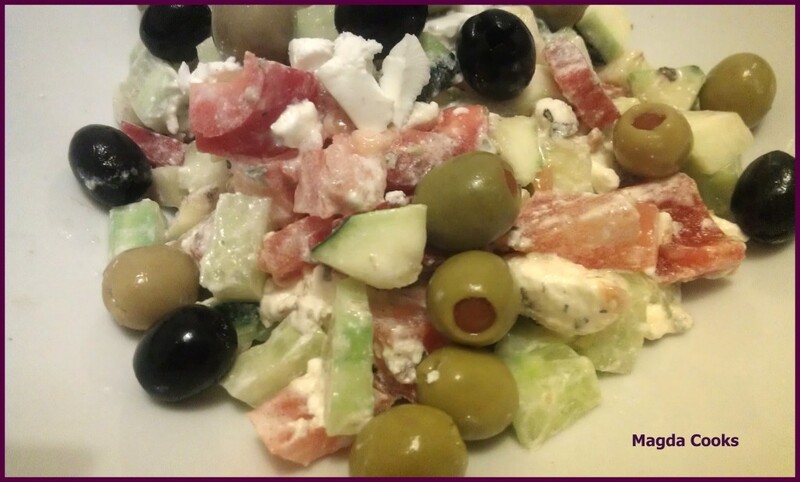 But… lately I found an idea for greek salad with a twist. I made it, along with my modifications, and liked it so much I decided to share this simple recipe with you. I’m going to use this dish as a side dish/salad with meat meals and since I’m trying to cut carbs from my diet – I’ll use it as my work lunch food. Actually the original recipe called for spice mix and then additionally for a dressing, but by my mistake the ingredients below created such a unique flavor I decided against adding a dressing. If the zucchinis are matured, peel the skin in couple places, not completely, just leaving strips here and there. Smear with oil and place on heated grill and grill until nice stripes show up. Place on the plate and set aside. While zucchinis are are getting this cute brown stripes, cut tomatoes, cucumbers and bell pepper into nice chunks (1 cm). If zucchinis cooled a bit, treat it the same way. Toss all the veggies into the bowl, Sprinkle with oregano and add crumbled feta. Mix good and set aside for 15 min. Warmth from the zucchinis should melt feta a bit and other veggies should release some juice and this will create extremely tasty dressing on it’s own. So now you know, what was my mistake or rather impatience 0_o.